Like much of North America, winter seems very hesitant this year in the U.P. Usually by the end of December, we have had many feet of snow (I believe we average around 240-250 inches a year) and are merrily cross-country skiing along the miles of great trails up here. Aside from a foot or so in early December and a snow shower here and there, we’ve had nothing. Nada. Bubkes. Very annoying for skiing, but great for log prep. 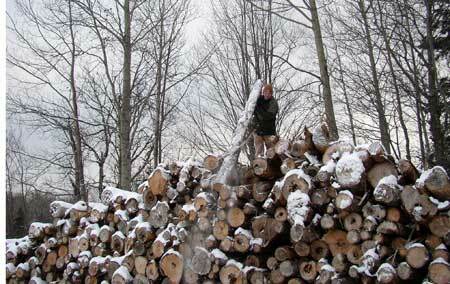 I throw the eight-foot logs off the top of the pile. The neighbor’s dog, Grady, is very excited about critters living in the log pile, but by the time I hoist the logs off, they’re long gone. We set the log on our sawbuck/cutting table and peel the bark off (usually it’s mostly fallen off anyway). We “borrowed” the plans for this from Bruce Barna, who helped his daughter Nicole build a cordwood “dorm room” not too far from here. 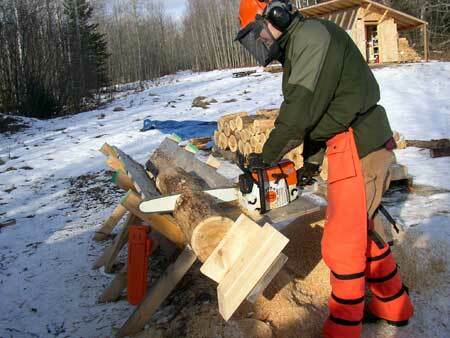 The chainsaw attaches to a hinged plate. All we do is slide the log down the table until it hits the stop, pivot the saw through the log, pull the saw back up and repeat until we’ve cut up the entire log. At this point there’s a pile of 16-inch logs on the ground. We move the logs to the pile – first, we filled up the kiln, then the back of the shed, now we’re working on a pile near the sawbuck. 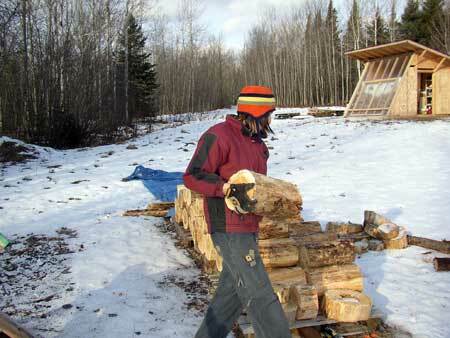 We hope to cordwood the shed walls this summer as we’re putting up the house frame and roof. This way we can experiment with various mortar mixes and techniques. 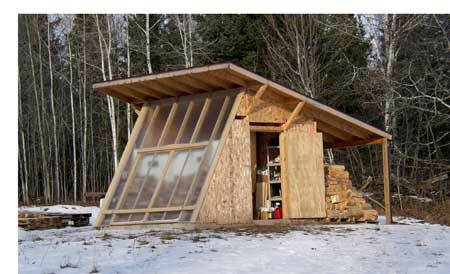 Plus, cordwood shed! Previous PostPrevious Did I mention logs?